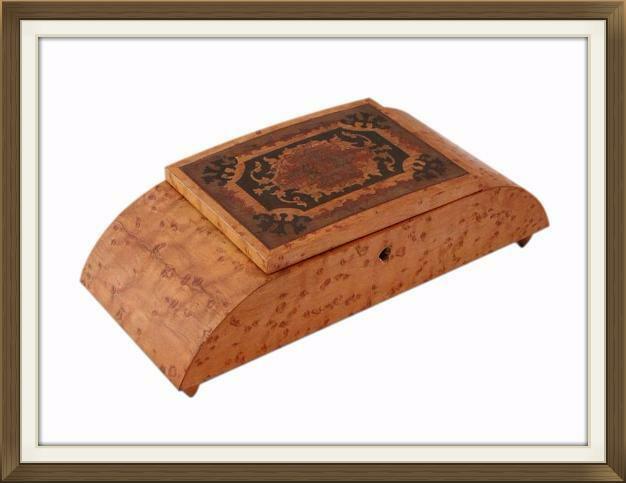 This is a lovely small Italian musical jewellery box, made in Sorrento and dating to the 1940s. It is in complete, original, untouched condition. 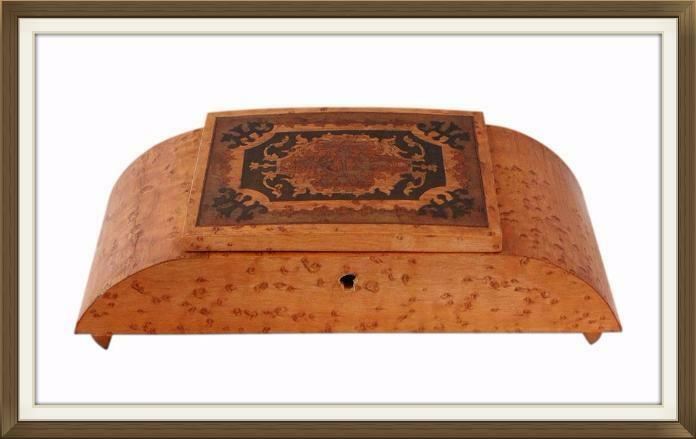 The exterior has a beautiful Burl wood veneer and wonderful inlaid decoration on the lid. 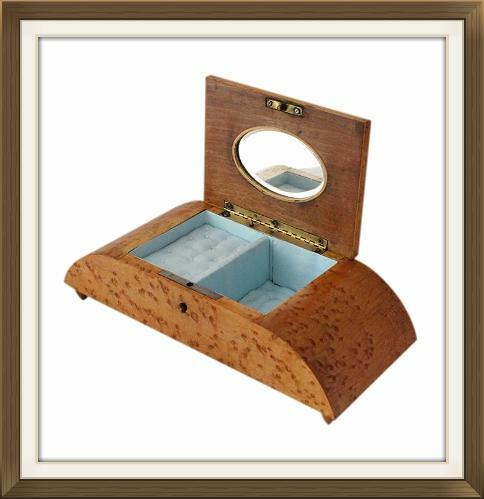 The inlay is made up of several varieties of wood and is set flush into the lid. 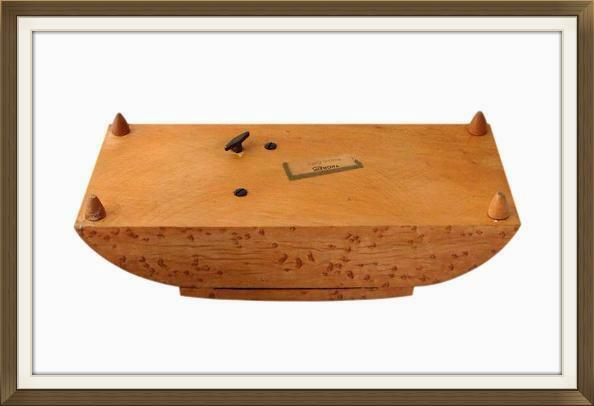 The box is complete with its original brass piano hinge, and stands raised on its original turned wood feet. The original label of the musical movement is still present on the bottom of the box. The interior has a single storage compartment. The musical movement is nicely cased to the left of this, and there is shallow storage space upon the ledge of the casing. 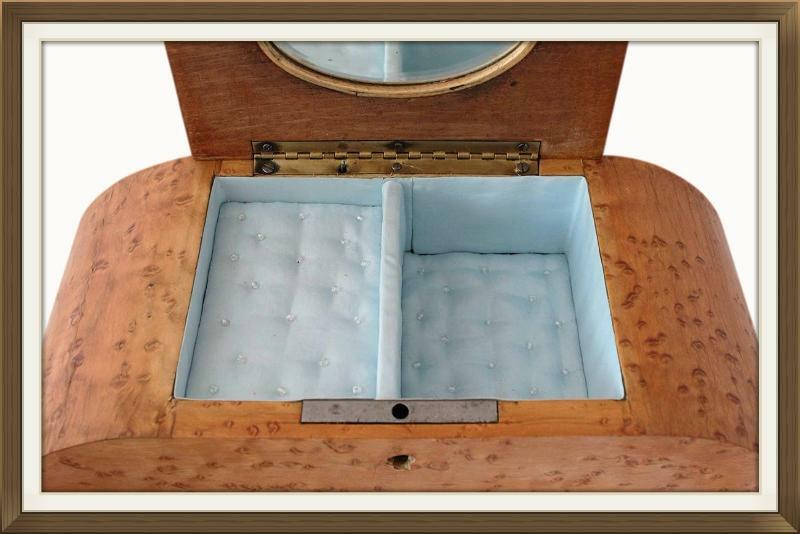 The compartment and ledge have pale blue satin panels. These have a very pretty quilted design and are beautifully finished with clear beads. The interior walls have satin linings which are the same shade as the panels. The panels and linings are original. There is a lovely oval mirror to the inside of the lid. 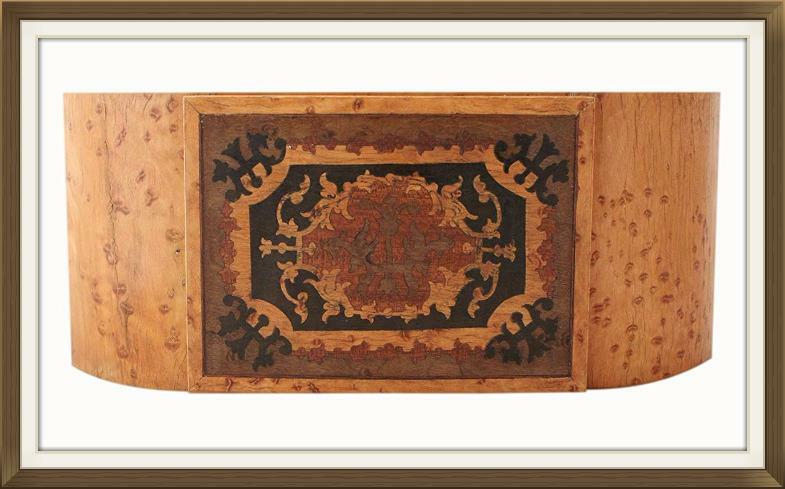 This is deeply set and surrounded by a nice inlaid frame. The mirror is also original. The lock is original but we do not have its key. This box has a quality Swiss Thorens movement, which plays a beautiful tune called 'Maria Mary'. The movement is in perfect working order and plays the tune at its correct tempo. The music stops as it should, when the lid is closed, or when the movement is fully unwound. The musical movement is operated via the winding key on the bottom of the box. 6 turns of the key are sufficient to fully wind the movement. As with all musical boxes, care should be taken not to over wind the movement. Over winding could result in the movement malfunctioning. We are not responsible for movements that are over wound, or for movements which deteriorate from further age and use, once the box is purchased. This wonderful box is in lovely condition, despite its 75 years of age. The interior satin is in superb clean condition with no splits or fraying, and no missing beads. It appears that the interior has rarely been used, if ever. All of the inlay and veneer is present. There is a minor fine crack in the veneer, on the left arched side of the box. This is age related and not as a result of a knock. The keyhole is not perfectly symmetrical but this is not overly noticeable. 8.0 by 6.0cm with a 3.8cm depth. 8.0 by 5.3cm with a 1.0cm depth. International postage is £25, delivered fast within 3-5 working days to Europe, and 5-7 working days to the rest of the world. Enjoy £10 off Vintage & Antique Jewellery, plus free UK Next Day delivery on our sister site, The Antique Jewellery Shop. Please see website for details.